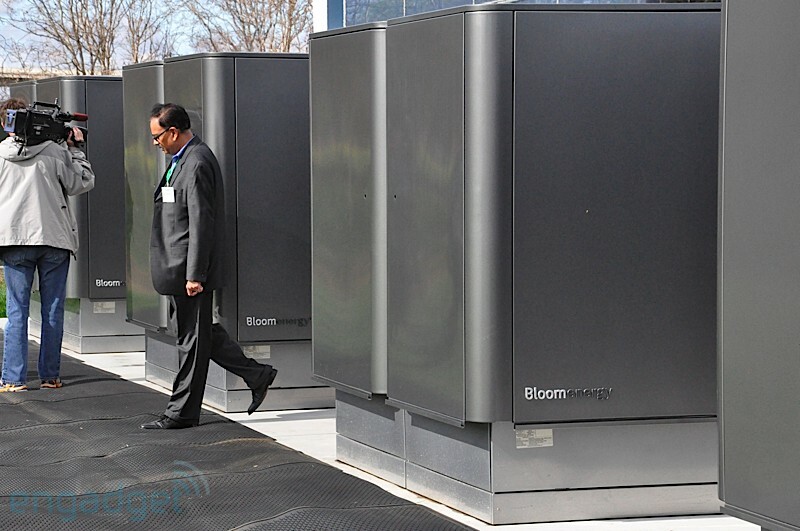 So here it is, the now-famous (that was fast) Bloom “Box” Energy Servers — all five of ’em — working their magic at eBay’s north campus. Not much to look at, but we’re happy to say it retains a low temperature — the only heat we really found was due to direct exposure to the light — and remains quiet while running. There are vents just underneath the sides where cool air was being pumped out. Of course, its raison d’etre is its ability to more efficiently deliver power, which is not something we can really test ourselves. Bloom Energy showcased a number of customers today — FedEx, Walmart, Staples, Google, Coca-Cola, Bank of America, Cox, and of course, eBay — and if the numbers meet their mark, you can color us mighty impressed. You know the drill: gallery below, quick video after the break! This entry was posted in bio-technology, decibeldeluge, energy, natural resources, technology. Bookmark the permalink.